Sunset Overdrive should come with an addiction warning. 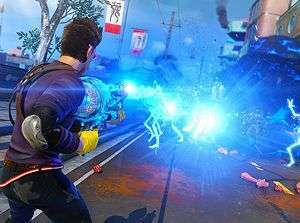 Much like the OverCharge Delirium XT energy drink Sunset City’s residents-turned-mutants have become hooked on, Sunset Overdrive’s typically Insomniac brand of barminess can prove a challenge to resist. It’s bursting at the seams with colour and character, packs some legitimate laugh-out-loud moments and, above all, is an absolute blast to play from start to finish – it’s the anti-Watch_Dogs, you could say. While it may not be the biggest or most hyped new name in open-world games this year, you’ll likely come away with more fond memories here than you did with Aiden Pierce’s personality-free hackathon. 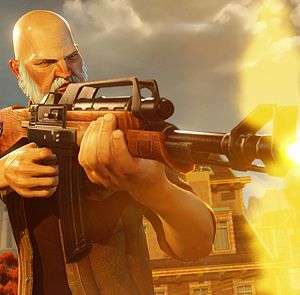 With a capital F, Sunset Overdrive puts fun at the forefront of everything it does, turning out to be one of the year’s greatest surprises and making a strong case for Insomniac’s and Xbox One’s best game to date. It goes without saying, but the plot is brazenly ludicrous (this is an Insomniac game called Sunset Overdrive after all), and all the better for it. The game opens with megacorporation FizzCo throwing an extravagant launch party in their hometown of Sunset City for its new energy drink, the previously mentioned OverCharge Delirium XT. Unfortunately for all the partygoers, this new untested beverage does more than give you wings. Disco turns to disaster, as everyone who downed a complimentary can mutates into mindless monsters, the OD, resulting in FizzCo cordoning off the city (with an invisible wall, of all things) in an attempt to cover up their corner-cutting from the rest of the world. As a survivor, and former FizzCo employee who was tasked with cleaning up the mess from the party, it’s your job to, er, well, clean up the whole city, aiding fellow oddball survivors and ultimately get to the bottom of the FizzCo conspiracy. What’s surprising is how enjoyable this daft paper-thin story actually is. It’s rubbish, of course, serving its purpose in only framing the mad goings-on, but it plods along nicely, generally speaking, offers a more comical and light-hearted take on the apocalypse we rarely see in videogames (the devs call it the awesomepocolypse), and rounds things off with a suitably over-the-top finale. It helps that the cast, despite being mostly douches of varying degrees, are a distinct and likeable bunch of misfits, in a way Far Cry 3’s Jason Brody and his fellow self-righteous twits weren’t, with some pleasantly delivered voice acting to boot too. It’s not deep or particularly memorable, or even original for that matter, but it’s hard not to crack a smile at the absurdity of events that unfold, and at the end of the day, that’s what Sunset Overdrive’s really all about. Naturally, that ethos for fun translates to gameplay too. There are no stodgy cover systems to contend with or hackneyed radio towers to activate or any other kind fashionable mechanics or systems to speak of that would stop the good times rolling. If it lessens your enjoyment it’s out; if it heightens it then it’s in, no matter how nonsensical it may be. Thus, you can grind on railings and wires in your everyday shoes, bounce on practically any surface that isn’t concrete, and defy gravity by endlessly wall-running around buildings, all in a trailblazing glory for no other reason than it’s a videogame, and it never shies away from that fact, often making fun of itself and others in fourth-wall-breaking bouts of comedy. Not every gag hits the mark spot-on, with some feeling particularly over-egged at times, but for the most part you’ll be audibly chortling away to yourself at all the knowing nods and quick-fire quips your character regularly spurts out to other characters and to you. Unfortunately, mission objectives are the standard uninspired open world guff of go here and shoot that, which would normally be a problem if the actual getting there and shooting that wasn’t so fulfilling. The empowering move set means navigating Sunset City’s varied and vibrant districts can sometimes be half of the fun, and the addition of an air dash and the ability to bounce even higher with a well-timed tap of the jump button before landing on a springy surface later on in the game improves things even more so. With skill, it’s possible to cross the city without touching the ground in one flowing motion, and the traversal challenges dotted around the world are a welcome aside to prove your prowess. But it wouldn’t be an Insomniac game without an assortment of exotic madcap weaponry would it now, and some of Sunset’s arsenal is up there with Ratchet’s very best. Every one of the twenty-plus unique weapons serves a specific purpose, be it providing support, distractions or excellent explosions. The Turret Copter, for example, deploys mini remote-controlled choppers which lend additional firepower to your cause, handy for crowd control. Meanwhile, the Captain Ahab is a harpoon gun that spreads a pool of OverCharge when shot, attracting nearby OD and leaving them open to further attacks. Then there’s the TNTeddy, which pretty much does what it says on the tin: explosive teddy bears (don’t try this at home, kids)! Sure, they’re mostly conventional weapons bearing outlandish disguises, but Insomniac have a rare talent for lighting up the screen and your face when you pull the trigger. Despite a large roster to choose from, it can become all too easy to grow reliant on a select few weapons at first, especially since they automatically upgrade themselves the more you use them, similar to Resistance 3. At the same time, using the same guns can grow tiresome. Curiosity begins to get the better of you, and the auto-upgrades are a compelling enough reason alone to try something new. Plus, being able to equip up to eight weapons at once means there’s always opportunity to experiment, and the OD, which come in various shapes and sizes, Scabs (human aggressors) and FizzCo Security Robots all have their own weaknesses, so it’s always wise and encouraged to arm yourself with a range of tools so you’re always ready to deal with any situation. Mixing things even further, to the point where it becomes a little too complicated for its own good, are Amps, Overdrives and Badges. Amps come in two flavours: Weapon Amps and Character Amps. The former are combined with your weapons to add buffs, usually of the tried and tested elemental kind, but some are more abstract and destructive: Fear The Reaper can summon the Grim Reaper to fight alongside you, while Twist Of Fate has a chance of setting off a mini nuclear explosion, Fat Man style. Character Amps do pretty much the same, except they apply to your character instead of your guns, and come in yet more variations (keep up). Between Melee, Hero, Dive Bomb, and Epic Amps, they’ll turn you into a near-unstoppable killing force, spawning tornados with every swing of your melee weapon, striking your foes with lightning from the sky, and dealing more damage the less health you have. It’s therapeutic stuff, to say the least, watching the screen fill with the orange gunk of felled OD as you grow more powerful while wreaking juvenile havoc across your new favourite playground. However, new Amps can only be bought with the collectible items scattered through the city, and Character Amps only activate if you’ve filled your Style Meter, a four-part gauge at the top right of the screen which gradually fills up with every kill and move you make, with each segment triggering a different Amp. 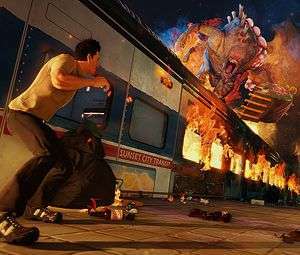 By necessity, then, Sunset Overdrive isn’t a game where you can, or even want to, stand still and take pot-shots from behind cover. You need to keep moving, not only to avoid getting swamped but also get the most from you equipped Amps and earn sweeter rewards. Stemming from your stylish performances are Overdrives and Badges. Killing while grinding or bouncing or using specific weapon types or slaying certain enemies will earn you Badges, and those Badges can be turned in to purchase Overdrives, boosts to your damage-dealing stats. It’s a system which rewards you preferred style of play – if you favour single-shot weapons while bouncing from bonnet to bonnet, you’ll become increasingly more deadly at the routine – while never cutting off alternate approaches to your OD cleansing and Scab killing. The problem is the whole complicated interplay between Amps, Overdrives and Badges, plus the various currencies you gather, is never explained well enough, and with so many separate aspects to keep an eye on it can send your brain into overload. You may not even be aware some of these things are available. At least when it comes to Amps, the best are dished out through story progression, although you will need to have gathered a certain number of collectible items before starting the mission that grants them, but the small quantities required will likely have been picked up through natural play. There are four bases throughout Sunset City, and as each one unlocks you’ll be called upon to take part in a Night Defence mission. These see your new Amps cooking in large vats filled with OverCharge, which of course attract the attention of any and every nearby OD, and it’s your job to defend the vats by laying traps and using your excessive firepower to keep the horde at bay. If anything, these sections are underplayed, not lasting long enough nor providing much of a challenge. The same could be said of the otherwise entertaining boss battles too; it’s honestly a shame when they come to a close. Still, if you don’t get your fill of Night Defence offline, then you should check out Sunset Overdrive’s Chaos Squad online. Accessed via numerous photo booths in single-player, Chaos Squad is an eight player, round-based co-operative mode with competitive score chasing. Players vote on several mission types to tackle before climaxing in a grand Night Defence finale, the difficulty of which is determined by the success of the previous missions. Again, a lack of challenge lets the side down, especially if all eight players (or even half of them) have developed their characters to the peak of their powers, which is quite a sight to behold once the shooting starts, it has to be said. The chance to bring new Amps into single-player, some of which can only be unlocked in Chaos Squad, is a draw however, but on the whole the mode gets pretty old fairly quickly. But that could change. Sunset Overdrive is designed to evolve and adapt as players get their hands on it, with Insomniac monitoring player behaviour and feedback. Sunset TV, a weekly dev diary of sorts which can be viewed within Sunset City itself, keeps you up to date of any forthcoming changes and community challenges, and actively encourages all players’ voices to be heard. So, if you’ve got an idea or any issues with the game, let Insomniac know, and it might just make it in. That’ll be a boost in Night Defence difficulty please, then. It’ll be interesting to see how the Sunset Overdrive of today will differ from that of tomorrow. Much like Saint’s Row, Sunset Overdrive is a dumb game created by smart people. 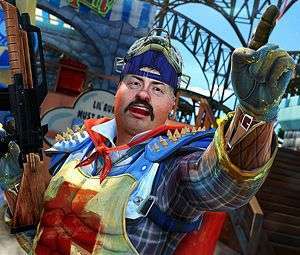 It prioritises fun above all else, letting you run riot with some of the world’s wackiest weaponry and pull off outrageous stunts in a packed sun-soaked open world brimming with colour and personality. And if players get behind it, there’s potential for things to get even better in the future. It may lack the universal charm of Insomniac’s own Ratchet & Clank series, and some needlessly overcomplicated and poorly explained systems are a downer, but Sunset Overdrive is a game every Xbox One early adopter should play, if not quite a game everyone else should buy an Xbox One for.